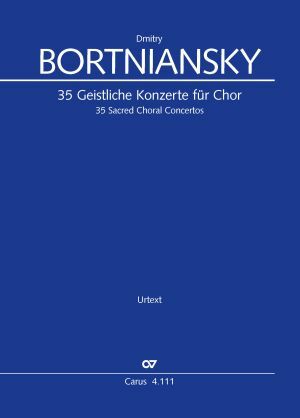 Dmitry Bortniansky (1751–1825), is among the most famous and most performed composers of Slavic choral music. He is credited with developing the genre of the sacred choral concerto (comparable to the Western a cappella motet or cantata) to its highest level. His thirty-five choral concertos for four voices were first published as a set in the early nineteenth century, however then they were published with only a Cyrillic text. What distinguishes the present edition is the addition, for the first time, of the Church Slavonic text in transliteration directly in the scores alongside the Cyrillic letters. 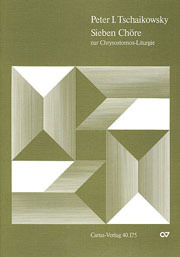 In addition, the present Urtext edition is based on an exhaustive comparison of all early sources preserved in Austrian, British, and Russian archives. 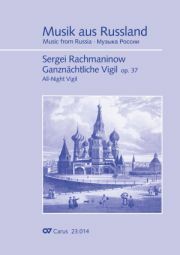 The editor of this edition has placed special emphasis on presenting an exact rendering of the dynamics and expressive markings as conceived by the composer himself, amending all inaccuracies of the edition edited by Tchaikovsky (1882). Similarly, the careful transliteration reflects the manner in which Church Slavonic was pronounced in Bortniansky's day. German and English translations (non singable) of the text at the end of each concerto. A practical pronunciation guide for the singing texts to be found on the Internet. Separate editions of individual concertos are also available for sale. Neben dem vorbildlich edierten Notentext gibt es ein ausführliches dreisprachiges Vorwort, das in die besondere Spezies dieser Musik einführt. Eine übersichtliche Tabelle verzeichnet die vertonten Bibelstellen (30 Psalmvertonungen, 1 aus dem Buch der Könige) bzw. freien Textvorlagen (4). Die Ausgabe wird durch einen umfangreichen Kritischen Bericht abgerundet. Die Carusausgabe bietet nun seine [Bortinanskys] 35 geistlichen Konzerte [...] in vorbildlicher Aufmachung an. Neben dem originalen kyrillischen Text erleichtert eine weitere Transliteration eine einfachere Realisierung. [D]ie deutsche und englische Übersetzung des Textes ist [...] abgedruckt und wer Beispiele für die [...] richtige Aussprache [...] braucht, findet diese als Soundfiles im Internet.